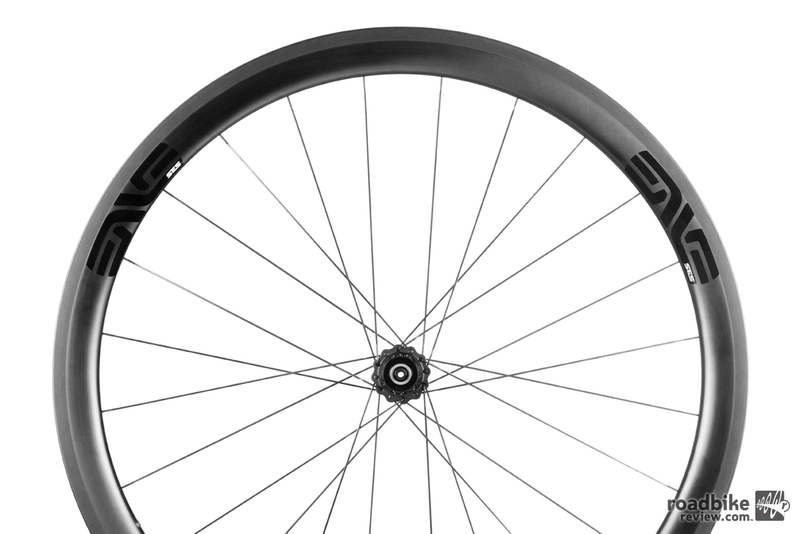 The SES 3.4 is the best selling wheel in the ENVE line-up. February has been a busy month for composite component maker ENVE. The Utah-based crafters of all things carbon unveiled a new road wheel, seatpost, and fork. 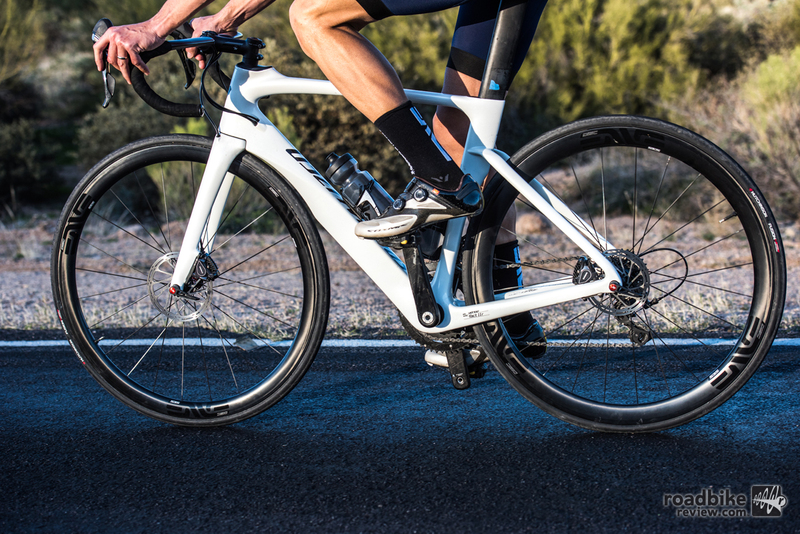 Here’s what you need to know starting with the redesigned Smart ENVE System (SES) 3.4 in both rim brake and disc brake models. Originally launched in 2011, the SES 3.4 was introduced to the aftermarket as a “climbing wheel with an aero advantage.” Once introduced, the SES 3.4 quickly established itself as the best-selling wheelset in ENVE’s lineup. 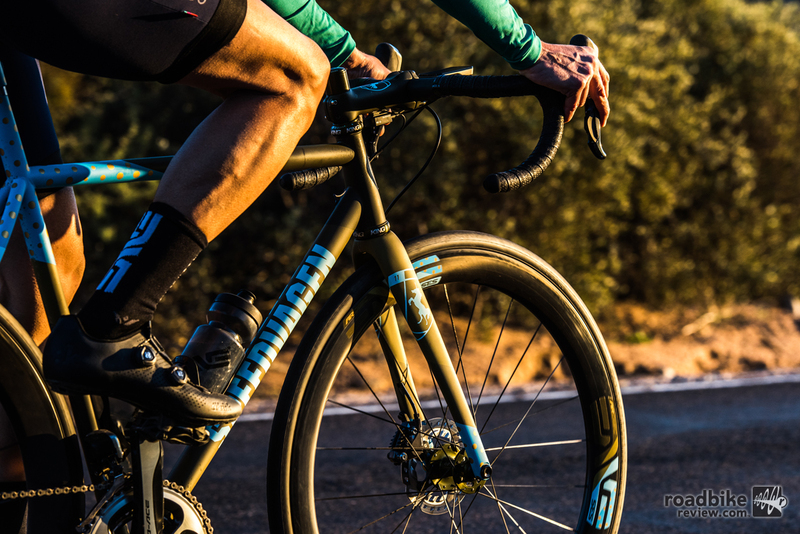 ENVE’s latest SES 3.4 builds upon its heritage as a climbing wheel with aero attributes, but takes a more holistic approach to refine performance in all terrain and weather conditions. Modern road bikes have ample clearance between the rim and seat/chainstays to allow the front and rear rims to have the same internal rim width of 21mm. 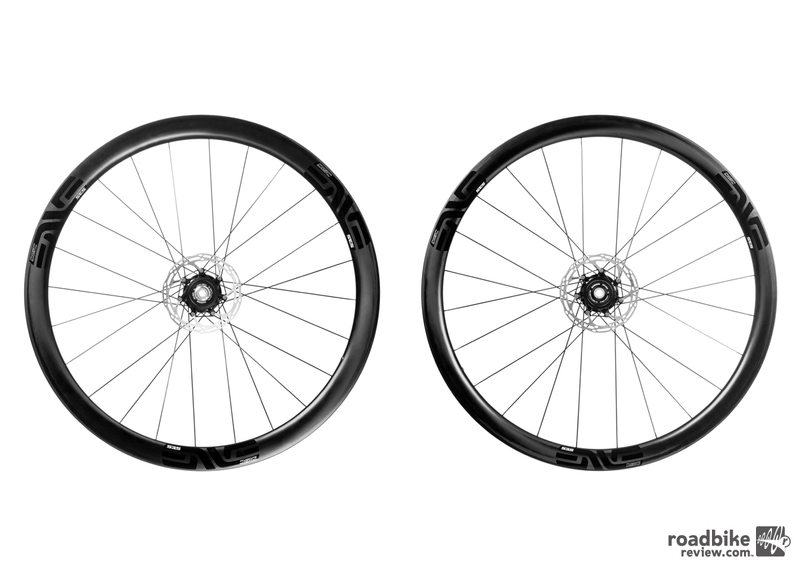 The new SES 3.4 (price starts at $2900) features ENVE’s patented SES rim shape with dissimilar rim geometries between the front and rear wheels and has been optimized around a labeled tire size of 25mm. The front rim sits at a depth of 38mm with the rear rim at 42mm. While the original SES wheel models had dissimilar rim widths between the front and rear rim, modern road bikes have ample clearance between the rim and seat/chainstays to allow the front and rear rims to have the same internal rim width of 21mm. While the rim widths are effectively matched front to rear, both the front and rear rims maintain unique profile curvatures to favor the airflow seen at the front and back ends of the bicycles respectively. 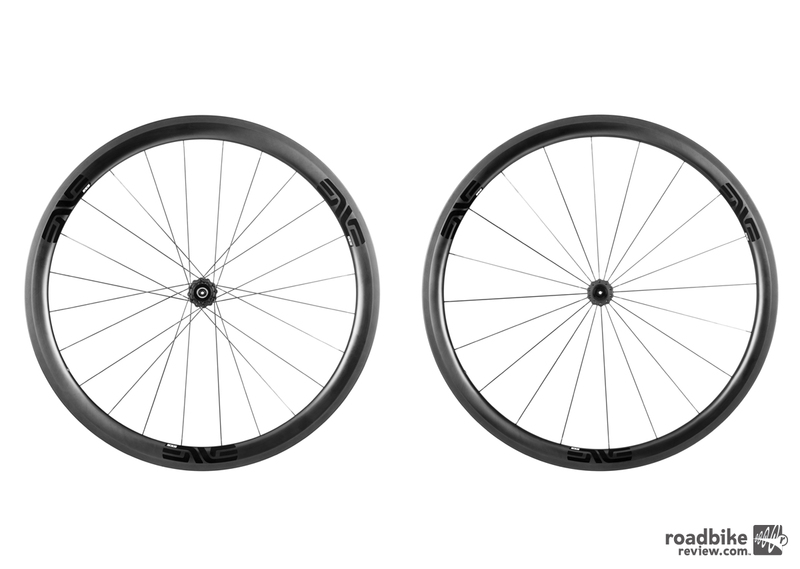 ENVE explained that during the development of their new SES 3.4 the goal was not simply to reduce aerodynamic drag, but to create a faster wheel through a holistic approach to wheel design. As such, analysis of the numbers actually shows that the latest SES 3.4 is in fact slightly slower on average across all yaw angles when compared to the original SES 3.4. The front rim sits at a depth of 38mm with the rear rim at 42mm. The latest SES 3.4 comes in both rim and disc brake specific models. For ENVE, disc brake specific means that everything from the rim shape to the rim laminate is optimized for use with a disc brake road bike. The result is that the disc brake wheel models are lighter weight than their rim brake counterparts without sacrificing strength or stiffness. The wheels feature ENVE’s patented SES rim shape with dissimilar rim geometries between the front and rear wheels and has been optimized around a labeled tire size of 25mm. The new SES 3.4 rim brake clincher is available now. 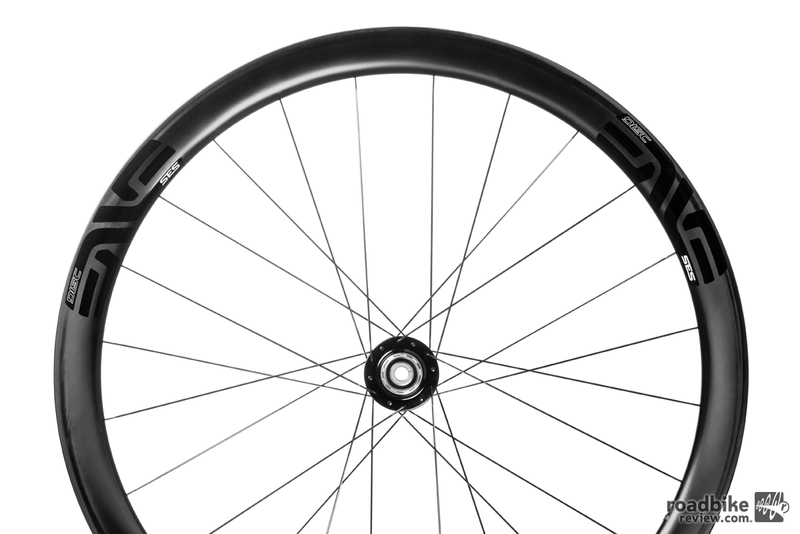 The SES 3.4 rim brake tubular and disc brake clincher models will be available April 1st. The 300mm seatpost was developed to save weight. ENVE has also released its new Road Seatpost ($275), a 300mm long post that includes a battery retention plug. 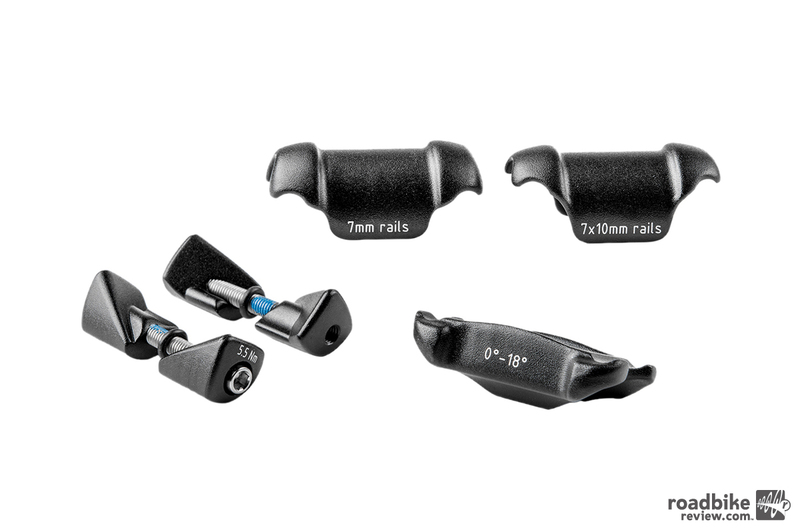 The ENVE Road Seatpost is available in 25.4mm and 27.2mm sizes with both 0mm and 25mm offsets. The ENVE Road Seatpost is available in 25.4mm and 27.2mm sizes with both 0mm and 25mm offsets. The weight of the ENVE Road Seatpost is claimed to be 168 grams for the 0mm offset models and 178 grams for the 25mm offset models. 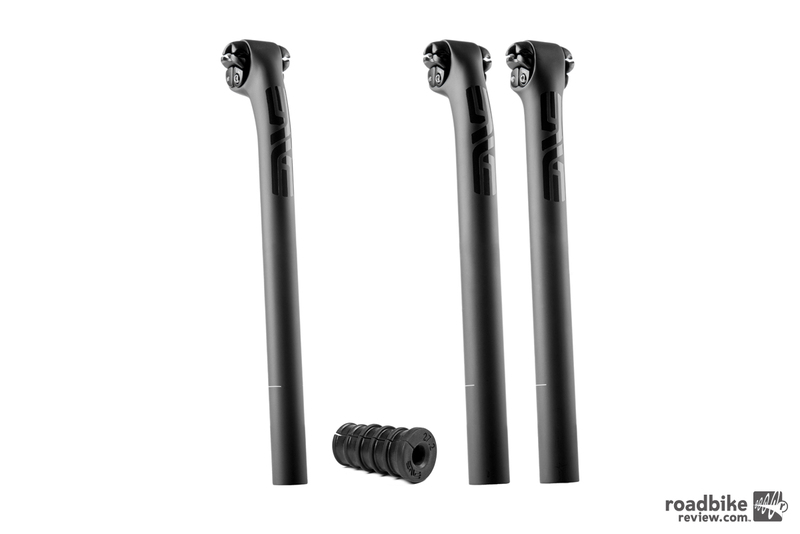 For riders who need more length or a larger diameter, ENVE will retain their existing 400mm seatpost in the lineup. “Like our other components, the Road Seatpost is molded in one piece from top to bottom. 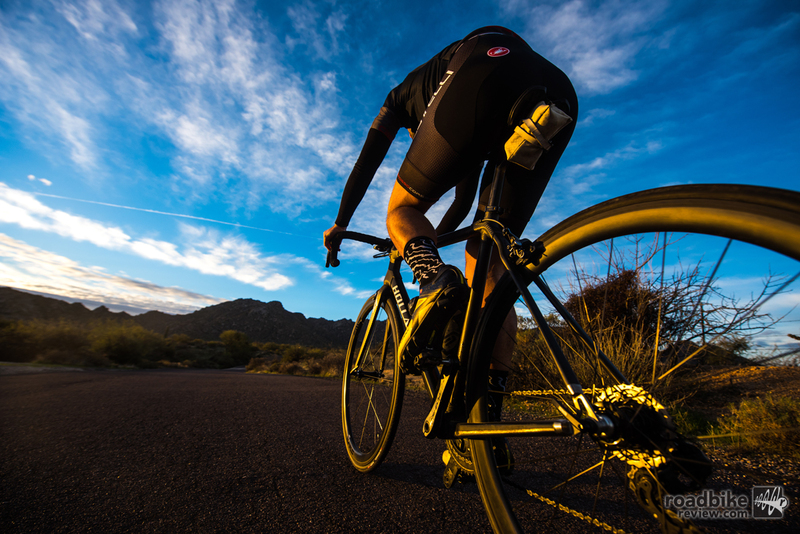 This process plays to the strengths of the carbon fibers and allows us to make a seatpost that is not only very light, but extremely durable,” said Chief Engineer Kevin Nelson. This new seatpost retains our patented horizontal twin-bolt design but features a new laminate that is refined specifically for the demands of road cycling. For those looking for an aftermarket seatpost battery retention solution, the ENVE Battery Retention Plugs ($20) are available for the aftermarket. These plugs come in three sizes; 25.4, 27.2, and 30.9/31.6. Price for the new fork is $575. 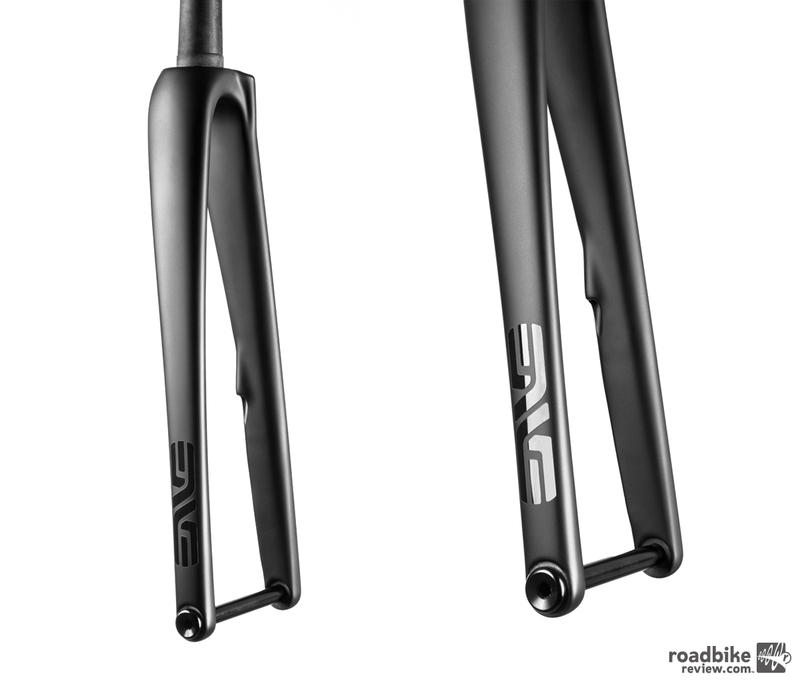 Finally ENVE has introduced a redesigned road disc brake fork. The new Road Disc Fork ($575), while classified for road racing, features clearance for 32mm tires while maintaining an axle to crown height of 370mm. 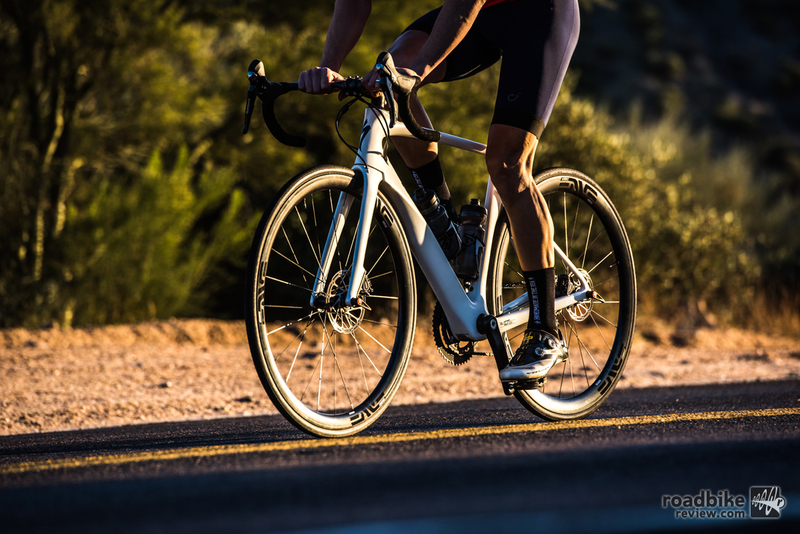 “Disc brakes have opened up the realm of possibilities in fork and wheel design and this has allowed us to create products that inspire more confidence on the road. The new Road Disc Fork is a perfect example, when we had to design a race fork for rim brakes, the brake caliper limited the amount of flexibility we had in terms of fork lengths and tire clearances. Disc brakes removed these limitations and allowed us to make this fork which offers compatibility with a broad range of tire sizes without sacrificing the geometry and handling of a race bike,” explained Pantone. 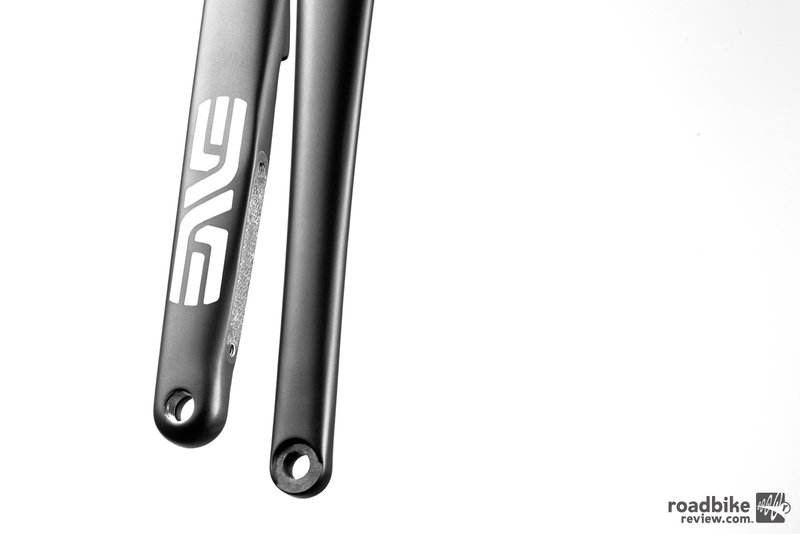 Like all ENVE forks, the new Road Disc Fork is molded in one-piece from the drop-outs to the top of the steerer-tube. This construction method plays to the strengths of the carbon fiber by allowing the fibers to run uninterrupted throughout the part. The end result is a fork that presents superior ride quality, strength, and stiffness compared to two-piece bonded or co-molded forks. The new fork features clearance for 32mm tires while maintaining an axle to crown height of 370mm. Other features include a solid 12mm alloy thru-axle, internal disc brake hose routing, flat mount caliper attachment, and two size options, 43mm rake or 50mm rake. The steerer-tube is 350mm long and tapered from 1.125” to 1.25”. For more information please visit enve.com. These climbing friendly hoops are available in rim and disc brake versions. The new SES 3.4 is tubeless compatible. Features include a solid 12mm alloy thru-axle, internal disc brake hose routing, flat mount caliper attachment, and two size options, 43mm rake or 50mm rake.